Gerber are a brilliant client to work with. Creative, expressive, fun and ambitious – a perfect fit for Intuitive. This was our first project for Gerber and the stand exceeded all expectations. Despite the relatively small footprint, the booth was immaculately finished and beautifully designed, giving Gerber tremendous presence at this important show. Gerber launched their international marketing effort with a vegence in 2012, unveiling a new logo and brand identity as well as opening their new international HQ in Germany. As such, their presence at the show attracted a huge amount of attention. With C-level dignitaries flying in from both Gerber and their parent company, Fiskars, every detail had to be perfect. 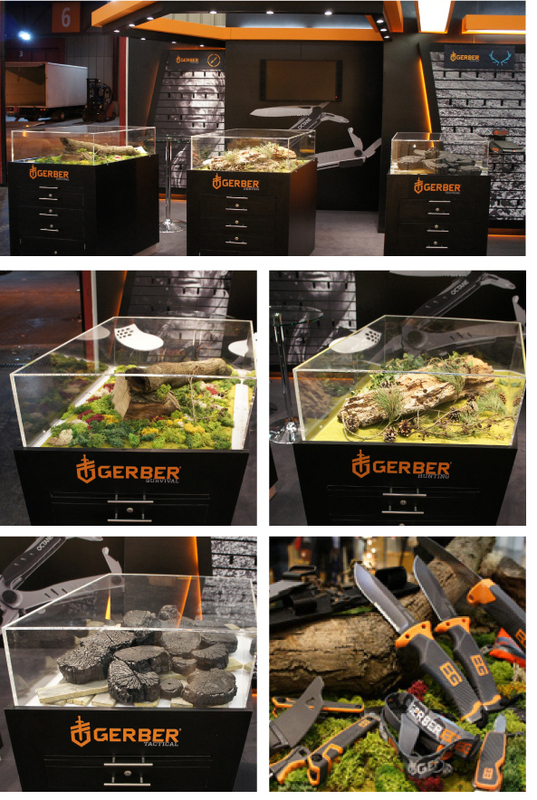 The results speak for themselves with more distributors signing up to carry Gerber’s new lines and a much larger stand presence in 2013. Intuitive also filmed and edited a striking video of the exhibition, providing insights into the latest products and featuring sound bites from Gerber’s product specialists and newly appointed, senior brand manager for EMEA and APAC. The video also featured Mark Seacat, a hugely respected hunter, photo journalist and avid supporter of Gerber’s tools.